Commission the Israeli visitors are "energy specialists." Since the mid-1960s law enforcement and regulatory agencies suspected a small nuclear processing facility in Pennsylvania had illegally diverted U.S. government-owned weapons-grade nuclear material into Israel's clandestine nuclear weapons program. The Nuclear Materials and Equipment Corporation received start-up capital organized by a mysterious former smuggler with deep and ongoing ties to Israeli intelligence. FBI investigations revealed NUMEC President Zalman Mordecai Shapiro also had repeated unexplained interactions with Israeli intelligence and organized a joint venture with the primary front organization of the Israeli nuclear weapons program. According to a 2001 US Department of Energy report, NUMEC still holds the record for the highest losses of bomb-grade material of any plant in the United States. In April 1976 Attorney General Edward Levi ordered the FBI to reopen an investigation into Dr. Zalman Shapiro and the Nuclear Materials and Equipment Corporation (NUMEC). The newly reopened investigation looked beyond violations of the Atomic Energy Act. The FBI's new mandate was to also uncover "any attempt by anyone in the executive branch to prevent or impede an investigation into this alleged diversion, or to withhold any information regarding this alleged diversion from any investigative body." The FBI code-named its investigation "DIVERT." The FBI interrogated high-level officials from U.S. government agencies and NUMEC employee eyewitnesses to nuclear diversion. Inexplicably, on January 23, 1981 the FBI placed the NUMEC investigation into "closed status" until further instructions from the Department of Justice. Field offices were ordered not to destroy files without instructions from FBI headquarters. The NUMEC investigation portfolio, which had passed from LBJ, to Nixon, and on to Ford was closed at the end of the Carter administration. 490 KB, 8 pages NUMEC is incorporated on December 31, 1956 in the Commonwealth of Pennsylvania by Zalman M. Shapiro (Nautilus nuclear submarine program chemist, Zionist Organization of America Pennsylvania chapter president), Leonard Pepkowtiz (Manhattan Project weapons physicist) and Frederick Foerscher. 219 KB, 25 pages Apollo Industries holding company created on March 1, 1958 out of merger of three defunct companies: Apollo Steel Company, American Nut and Bolt Fastener Company and San Toy Mining Company. Apollo Industry directors included Ivan J. Novick (future ZOA president) ,David Lowenthal (refugee smuggler who also fought in Israel), Zalman Shapiro (NUMEC president, ZOA chapter president), and Elliott W. Finkel (former DOJ attorney dismissed over conflicts of interest). 6.1 MB, 62 pages Company calendar listing NUMEC's services. 11031966_AEC_FBI_NUMEC_Activity.pdf John Vinciguerra of the Atomic Energy Agency provides a list of all NUMEC contracts with foreign governments as part of a Foreign Agent Registration Act and congressional review. 135 KB, 2 pages The Atomic Energy Commission gives Atlantic Richfield at $30 million/year contract to manage Hanford facilities if it buys and takes over NUMEC. Pages extracted from cost-plus operating contract. 04021968_Helms_Clark Director of Central Intelligence Agency memo to Attorney General Ramsey Clark. "You are well aware of the great concern which exists at the highest levels of this Government with regard to the proliferation of nuclear weapons...It is critical for us to establish whether or not the Israelis now have the capability of fabricating nuclear weapons which might be employed in the Near East...I urge that the Federal Bureau of Investigation be called upon to initiate a discreet intelligence investigation of all source nature of Dr. Shapiro in order to establish the nature and extent of his relationship with the Government of Israel." Release letter. 728 KB, 11 pages On September 6, 1968, the US attorney general requests investigation "whether the subject is acting as an agent of the Israeli Government." 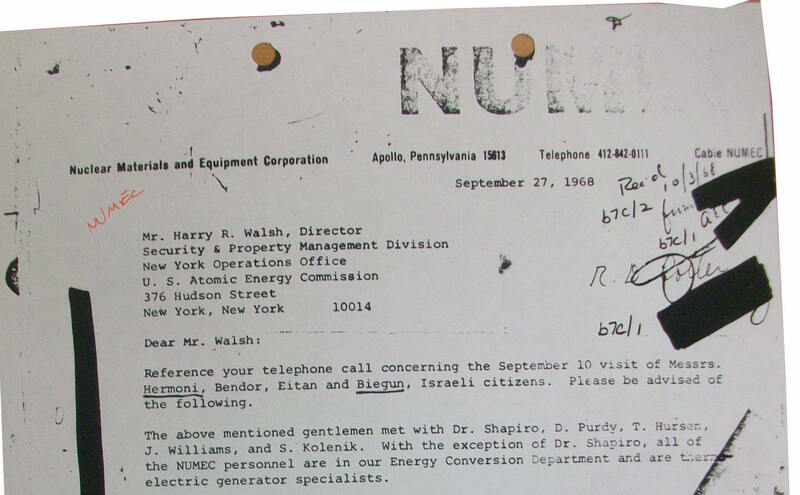 September 6, 1968 NUMEC request for visit of Avraham Hermoni (Israeli nuclear weapons chief), Ephraim Biegun, Avraham Bendor, and Rafael Eitan (founder of LAKAM economic espionage network). The intelligence operatives enter under the cover of being "thermo electric generator specialists." 35 KB, 1 page Censored content. 3.2 MB, 56 pages FBI initiates physical and wiretap surveillance of Zalman Shapiro on November 5, 1968. "We are investigating Shapiro to determine extent of his relations with Israeli government. As head of Nuclear Materials and Equipment Corporation, Apollo, Pennsylvania, which processes uranium-235 for nuclear reactors, Shapiro has access to atomic energy material which could be most helpful to the Israelis...subject has been in contact on two occasions with Dr. Avraham Hermoni, Scientific Counselor, Israeli Embassy, Washington D.C., and Israeli intelligence agent. Source has also disclosed contacts with a senior official of Israeli military intelligence, individuals associated with Israeli Atomic Energy Commission and member of Israeli Internal Security Service...he is considering settling permanently in that country and, if necessary, would fight for Israel..." "Investigation has further disclosed that subject and others involved in instant case, in addition to holding top positions in their respective fields, are very active and highly regarded in various Jewish organizations which exert some influence in this country...." "It is considered opinion of person familiar with this case that an interview with subject and/or others intimately involved in this case would develop very little pertinent information..." "Attorney General under date of 3/28/1969 approved our request for continuation of Electronic Surveillance for a period of three months effective 4/1/1969. Wiretap summaries. Atomic Energy Commission interview of Shapiro on August 14, 1969. Discussion of 1968 Hermoni meeting in Shapiro's home, clandestine Shapiro meeting with Israeli intelligence agent in Pittsburgh airport. "Only when we confronted with the fact that we were aware of the meeting did he admit to such a meeting had taken place and his explanation that the purpose of the meeting had been to discuss payment of a bill and other commercial matters did not appear to be completely candid..."
362 KB, 11 pages May 5, 1969 FBI wiretap of a radioactive spill at NUMEC caused by improper storage. "it�s not only a bad spill but �actually they are operating outside compliance.� They had the drums all together. They have about 200 drums and estimate that about six a day will corrode through. The trouble lay with a fluoride which was put in to help the decay, and this was not checked. CENSORED said they are also about $230,000 over on their construction costs for the scrap plant. Z [Zalman Shapiro] said if they could get other people, there would be a lot of firing." 3.1 MB, 39 pages Zalman Shapiro listed in "Security Index" because he "continues to solicit information of Israeli scientific [censored] personnel." NUMEC selected in 1964 to run "free world's only full-scale production boron isotope facility" in Niagara [Lewiston], NY. Shapiro assisting in a secret converter "British Project." Supermarket advertiser Frank Noll writes "Dr. X" story about Shapiro working in Israeli nuclear weapons program. 973 KB, 18 pages July, 1969 Henry Kissinger strategy document about what stance to take about the Israeli nuclear weapons program. "There is circumstantial evidence that some fissionable material available for Israel's weapons development was illegally obtained from the United States by about 1965." Justification for "ambiguity" stance. 1 MB, 26 pages Illegible files. September 3, 1969 FBI director memo to AEC and DOJ about August 1969 AEC interview of Zalman Shapiro. "The basis of the security risk posed by the subject lies in his continuing access to sensitive information and material and it is believed that the effective way to counter this risk would be to preclude Shapiro from such access, specifically by terminating his classified contracts and lifting his security clearances. AEC security statement that Shapiro has "knowingly established an association with individuals reliably reported as suspected of espionage." "It was reported in 1961 that Dr. Abraham Hermoni was a member of the Israeli Intelligence Service; that in 1963 Dr. Hermoni was known to be engaged in the establishment of a technical intelligence network in the United States, and that prior to his assignment as Scientific Counselor of the Israeli Embassy, Washington, D.C. he was intimately connected with Israeli efforts to develop nuclear weapons in his capacity as Technical Director, Armament Development Authority, Ministry of Defense." On November 4, 1970, the FBI notes that Shapiro has taken a job at Kawecki Berylco Industries, and "holds a 'Secret' clearance which was transferred to that facility by the Defense Supply Agency..." Note "Shapiro has been alleged to have furnished information to Israeli Government in the past regarding nuclear developments via Israeli Embassy officials interested in this field for the benefit of Israeli defense efforts. He is carried on the Security Index by Pittsburgh due to his activities. He has recently acquired a new and sensitive position with a nuclear development company in Pennsylvania...classified 'Secret' since it sets forth information from [censored] Army communications similarly classified." 09031969_FBI_v2, 2 pages, less redaction Release letter September 3, 1969 FBI Director memo to CIA Director. "The basis of the security risk posed by the subject lies in his continuing access to sensitive information and material and it is believed the only effective way to counter this risk would be to preclude Shapiro from access, specifically by terminating his classified contracts and lifting his security clearances..."
5.9 MB, 136 pages FBI interviews Kanwecki Berylco Industry executive on March 4, 1971 about Zalman Shapiro's attempts to obtain classified information without proper security clearance. Joint Committee on Atomic Energy attempts to obtain FBI files "concerning Shapiro or any of his associates or acquaintances who could be involved in intelligence or diversion of nuclear material activities on behalf of a foreign government." in May of 1976. FBI offers a summary, but states that attorney general would have to approve file release. April 22, 1976 summary of FBI investigations of NUMEC for special nuclear materials loss. On May 14, 1976 US attorney general orders an FBI investigation "be conducted to determine whether or not a diversion of nuclear material had occurred at the Nuclear Materials and Equipment Corporation (NUMEC), Apollo, Pennsylvania, partially owned and operated by the subject, and if this diversion had been to the benefit of the Government of Israel" and "Obstruction of Justice." Attorney General provides list of Atomic Energy Commission executives to interview. Fully and partially censored FBI interview records. 1976 investigation captioned "DIVERT." List of NUMEC executives to interview. FBI_Doc_672_Martin_Task_Force_12_7_78.pdf New! Departmental Attorney John L. Martin, Criminal Division tells the FBI he is leading a "three man Task Force organized by the Criminal Division pertaining to alegations of cover-ups by Governmental Agencies in the NUMEC case." 146 KB, 2 pages December 7, 1977 Memo to Zbigniew Brezinski about Congressional investigation of NUMEC. "Dingell's pursuit of the question of whether the CIA withheld information from other agencies strikes me as potentially dangerous..."
625 KB, 8 pages June 27, 1977 FBI interview of Zalman Shapiro. "..Shapiro voiced certain reservations relative to its purpose and was concerned that display of the form implied certain unlawful acts on his part." "Shapiro emphasized that the matter of significant diversion of special nuclear material at NUMEC was out of the question and added that Atomic Energy Commission (AEC) officials had, in fact, assured him personally that NUMEC MUF compared favorably with MUF experienced throughout the rest of the industry." 3.5 MB, 3 pages Classified summary of CIA Directorate of Operations briefing to the Nuclear Regulatory Commission about NUMEC diversion accidentally released to the Natural Resources Defense Council. "Mr. Duckett raised the question of whether the U.S. had intentiona1ly allowed material to go to Israel. He said that if any such scheme was under consideration, he would have known about it and he never heard so much as a rumor about this. He, therefore, does not believe there is any substance to this allegation. In support of this view, he related that CIA had drafted a National Intelligence Estimate on Israel's nuclear capability in 1968. It it was the conclusion that the Israelis had nuclear weapons. He showed it to Mr. Helms. Helms told him not to publish it and he would take it up with President Johnson. Mr. Helms later related that he had spoken to the president, that the President was concerned, and that he had said, 'Don't tell anyone else, even Dean Rusk and Robert McNamara." 482 KB, 1 page Glenn Seaborg office diary. On June 21, 1978 Department of Energy investigators Bill Knauf and Jim Anderson visit former Atomic Energy Commissioner Glenn T. Seaborg. They tell Seaborg that traces of Portsmouth U-235 (the government-owned material primarily delivered to NUMEC for processing into fuel) had been picked up in Israel. On March 3, 1979 Seaborg refuses to be interviewed by FBI investigators. Archive A 1978 General Accounting Office study concludes that the US government never credibly investigated the NUMEC diversion and documents FBI and CIA refusal to cooperate..
4.2 MB, 119 pages Transcript of December 21, 1978 Congressional Committee on Interior and Insular Affairs interview of Zalman Shapiro. "We know now that as far back as 1966, at least one staff member of the Joint Committee on Atomic Energy questioned the propriety of then AEC Chairman Seaborg having testified that he thought that " there has not been any material diverted from peaceful to military uses." We know also that in December 1971, William Riley, former director of AEC security, wrote in a memorandum that Dr. Shapiro reported to Riley that he (Dr. Shapiro) had been told by officials of the government of Israel that an unnamed AEC Commissioner had suggested to representatives of a foreign government that Dr. Shapiro had been involved in diversion of materials to the Israelis..."
3.4 MB, 131 pages 1977-1978 CIA files obtained via a FOIA lawsuit on August 31, 2015. The files detail a CIA cover-up that began in 1968 when the agency withheld overseas agent information from the FBI and other federal agencies about the diversion. 145 KB, 3 pages Confidential letter from Deputy Attorney General Benjamin Civiletti to President Jimmy Carter about how after the GAO report about NUMEC the US would "establish a plan for coordinated interagency action to detect and investigate the theft or diversion of nuclear material in the future." 6 MB, 19 pages Status report on "NUMEC, Shapiro, etc" from Science Advisor of the Interior Commission Henry Meyers to congressman Morris K. Udall. "That they picked up on the statement about the NUMEC design while failing to complain about CIA conclusions about a diversion is indicative of extreme sensitivity to any suggestion that NUMEC's purpose from the beginning had been to provide Israel high enriched uranium. 564 KB, 11 pages CIA Deputy Director for Operations John H. Stein's secret decision in 1979 that releasing NUMEC files was impossible "because of the need to have a coordinated Executive Branch position and our desire to protect a sensitive and valuable liaison equity." Stein referred to with Science Advisor of the Interior Commission Henry Meyer's blunt allegations (below) to Congressman Morris Udall in 1979 that NUMEC was just another Israeli smuggling front. 107 KB, 2 pages Staffer Jerry Oplinger asks National Security Advisor Zbigniew Brezinski for permission to show Senator John Glenn a top secret memorandum about "missing material from the NUMEC plant in Apollo, PA." Brezinski formally disapproves, telling Oplinger to "Brief him [Senator Glenn] orally." 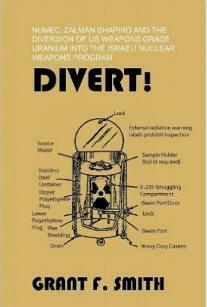 3.9 MB, 54 pages March 28, 1980 interviews with NRC officials reveal a former NUMEC employee eyewitness to diversion. FBI NUMEC truck driver interview. FBI NUMEC shipping clerk interview. March 24, 1980 FBI Ammonator interview. "he then noticed the NUMEC owner, Dr. Zalman Shapiro, pacing around the loading dock while [censored] (shipping and receiving foreman) and [censored] (truck driver for NUMEC) were loading 'stove pipes' into the steel cabinet type equipment that he observed on the truck...the 'stove pipes' are cylindrical storage containers used to store canisters of high enriched materials in the vaults located at the Apollo nuclear facility...the 'stove pipes' contained three or four canisters which were described as highly polished aluminum with standard printed square yellow labels, approximately three inches in diameter by six inches tall, that normally were used to store high enriched uranium products...defined as 95 percent uranium." January 15, 1981 former NUMEC employee interview. 4. Withdrawal sheets of sensitive material made at the request of the Justice Department in 2012, including a letter from President Jimmy Carter. Archive Zalman Shapiro seeks exoneration from the Nuclear Regulatory Commission assisted by Arnold & Porter (Israel's longest registered foreign agent law firm in Washington, DC) with assistance from Senator Arlen Specter. The NRC refuses to clear Shapiro or NUMEC over the U-235 losses. 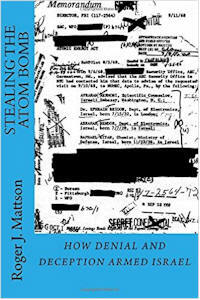 Based on an exhaustive review of formerly classified government documents-as well as previously unexplored corporate filings, office diaries and unguarded interviews-Grant F. Smith has written a riveting story of the 1960s diversion of US weapons-grade nuclear material from an Israeli front company in Pennsylvania into the clandestine Israeli atomic weapons program. The talented but highly conflicted founder of the Nuclear Materials and Equipment Corporation (NUMEC)-Dr. Zalman Mordecai Shapiro alongside his close friend and financial backer David Lowenthal-engaged in a ferocious clandestine drive to funnel the most valuable military material on earth that forever tilted the balance of power between Israel and the world. Divert! chronicles Zalman Shapiro's journey from crafting ingenious innovations for the Nautilus nuclear submarine in the 1950s to his costly pursuit of America's most advanced hydrogen bomb designs in the 1970s. Tasked during secret summits with high-level Israeli intelligence agents, guided by Israel's top nuclear arms designers, and defended by Israel and its US lobby, Shapiro and NUMEC drove the CIA and FBI from furious outrage to despair. Presidents from LBJ to Jimmy Carter secretly grappled with how to respond to Israel's brazen theft of American nuclear material before finally deciding to bury the entire affair in classified files. But NUMEC's toxic secrets have refused to be buried alive. Newly declassified wiretaps have risen from the grave, detailing Shapiro's utter contempt for worker and nuclear safety. David Lowenthal's role as an international refugee smuggler between the US, Europe and Israel-before organizing financing for NUMEC-is placed under new scrutiny. This explosive story emerges even as the US Army Corps of Engineers struggles to quietly clean NUMEC's toxic waste near Apollo, Pennsylvania with $170 million in taxpayer funding. At a time when America is coming under intense pressure to attack on the mere suspicion that Iran is diverting nuclear material, Divert! stands as the ultimate cautionary tale of how US Middle East policy is continually undermined from within by corruption, immunity, deceit and unwarranted secrecy. Paperback and Kindle.